What does TeamSpeak3 mean with "Opus Voice" and "Opus Music"? I'm assuming this has been asked over the years a couple times, but I can't find it on the forum (perhaps I'm not using the right keywords). In TeamSpeak 3, an arguably dated, but still very popular voice chatting/communication software, there is support for Opus and several ways to set quality. As you can see in the attached picture, I'm a little confused as to what they mean with "Opus Voice" and "Opus Music". TeamSpeak is notorious for not providing documentation, instead you're supposed to ask on their forums and read their FAQ, however their support on the forum is simply: "one should be used for voice, the other for music" without giving details how the codec is used internally. The quality control slider goes from '0' to '10', this sets the bandwidth in some way, but they're again nebulous on how it does that. Reading the man page of opusenc, I'm kinda let to believe, that the slider adjusts the computational complexity, perhaps (--comp N option). Whether selecting the voice or music variant, might be a front end to the --music and --speech options, but as I said above, it's all just guesswork. Personally, I've always used the --bitrate option to set the quality envelope, there's no way to set or select that in TS, I have no idea what it's doing in the background at all. In case anyone could perhaps shine some light on this, that'd be greatly appreciated. I was kinda thrusted into running a TS3 server after almost ten years. While I'm grateful for Opus support, I find the entire experience and especially the lack of documentation particularly unpleasant. There's not much I can do, as I see it. The program isn't open source, getting the functionality out of this won't be easy. The people I'm doing this for, insist on using TS3, there's not much I can do, I'm afraid. However, I'd want to do a good effort regardless. 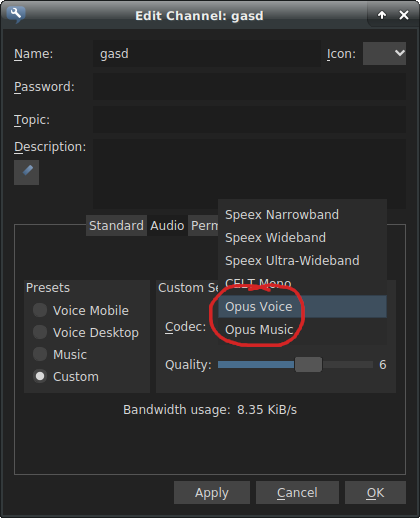 Re: What does TeamSpeak3 mean with "Opus Voice" and "Opus Music"? why not just use the highest opus voice setting and call it a day? well, at least I wanna know what it does. I think I'm just gonna leave it on Opus Music and maximum bandwith all the time. with those settings, it's like 11kb/s, max voice is 7.71kb/s. I don't even know how TeamSpeak guesses these numbers. Well, there's either the possibility they split CELT and SILK, or they're more likely using the codec's voice or music option, which controls which it tries to target with whatever bitrate you throw at it, which just has a little weight on which core codec it switches to. Probably at a high enough bitrate, it won't even matter which of those you happen to choose. Some people use TeamSpeak servers to play music and I suppose they don't want to leave it up to Opus to switch to the appropriate mode. If the bitrate is that low, I understand them needing to specify. Of course you can use Discord and a much higher Opus bitrate but I get it, some people are very entrenched in TeamSpeak. It'd be all making more sense, if they at least used the same names, that are used for the options in opusenc. Or at least made the slider have steps and numbers, that are like the bitrate setting or something. When I select "Opus Music" and then pull the slider all the way to the right (setting it to 10), the bandwidth is supposedly 11kb/s. That seems a bit low, even for a mono channel. I can only assume the bitrate estimation is completely meaningless. Once this works, I'll perhaps make a couple tests to see what those number actually mean. I guess you got the bitrate unit wrong. Teamspeak uses KiB, so that's kilobyte with kilo = 1024, so 11KiB/s = 90112 bit/s. Or Teamspeak got the unit wrong but if I remember correctly even Teamspeak 2 used bytes for bandwidth measurement. Teamspeak uses KiB, so that's kilobyte with kilo = 1024, so 11KiB/s = 90112 bit/s. Right, they even use "KiB/s" so that seems to make sense then - seems I've just mised that. But the slider going from 0 to 10 is still unclear what it does. Let alone the other options. Didn't they deprecate the weight thing in the latest opus version? Supposedly because it's a lot better at predicting what the content is? I'll have to dig into the DOCS. IDK why i keep going back and forth with this in my head.